Nokia E71x – Jane Talks Tech! You don’t need to download the Nokia Maps 2.0 version as I had had to do with Nokia PC Suite software & the older versions of the Maps software available. If you are using the Nokia PC Suite software, transition to the excellent Ovi Suite software which is now at v. 2.1.0.87. Ovi Suite now syncs your contact with your Ovi.com account! There is also better support for Microsoft Outlook and Windows Contacts syncing. With Ovi Suite software, installing Ovi Maps is significantly less tricky and quite unlike this post which gets a lot of hits from people interested in Ovi Maps on the Nokia E71x phone. 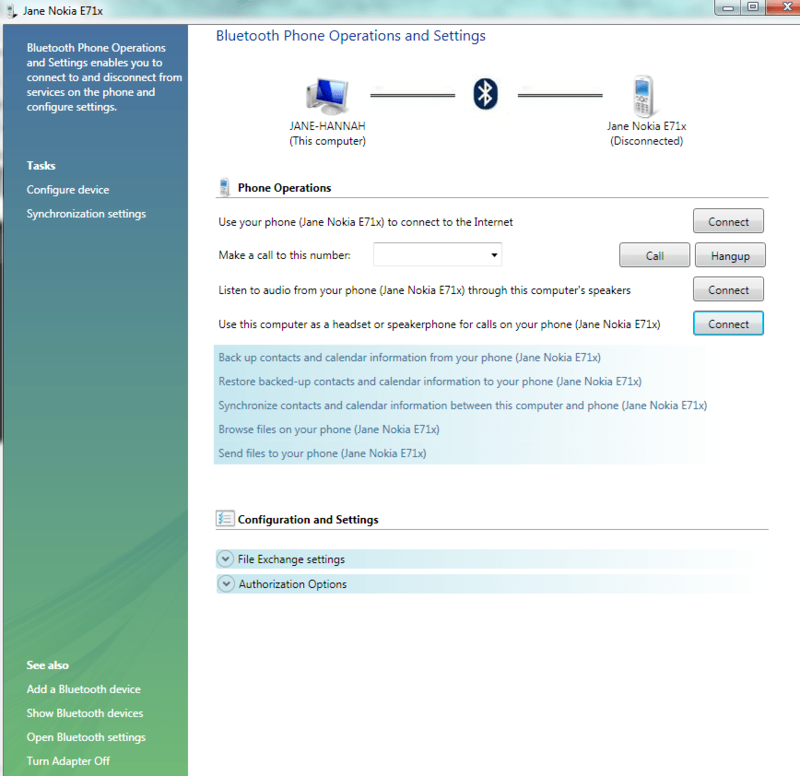 Download the most recent version of Nokia’s Ovi Suite software (v. 2.1.0.87). When installing, you will have the option of setting up your phone with the software. I connected my phone via the USB cable first. I recommend you do the same to avoid any potential issues with bluetooth. You can always set up your connection via bluetooth later. Follow the installation prompts and I would recommend making a backup of your phone before attempting anything else. Download the latest Ovi Maps .sis file for your device. In the case of E71x owners, we’re SOL because our device is not officially supported for use with Ovi Maps! However, I used the installation file (Nokia Maps 3.0_0302_3.2.sis) for initially installing Ovi Maps to my E71x. Once you have successfully installed Ovi Maps using that version listed above, fire up the Ovi Suite software and check up for updates. Please remember to have your 8GB microSD card inserted in your phone before you begin downloading any maps. If no updates are detected, start up the Ovi Maps application and check your file version. My Nokia E71x which is currently running the v3.28 firmware version has the following version information for the Ovi Maps software: v. 3.01 09wk44 b01. For what it’s worth (FWIW), here’s info on Ovi Suite and some items it installs on your computer. In order for me to help you, make sure you are running the later Ovi Suite version. You can access this same info by navigating to the ‘Help’ tab and clicking ‘About Ovi Suite’. Then, click on “System Information” and voila! This is one of the several posts I’ve made since I obtained the Nokia e71x phone. As you know, connecting the Nokia E71x phone to your computer via USB is a piece of cake. Pairing the Nokia E71x via bluetooth to your computer is also very easy. For proper context, my laptop was running the default bluetooth drivers. HP will not be officially supporting my laptop’s model (dv9700t CTO) for upgrades to Windows 7 and as you may know, I’ve been running Windows 7 since late October 2009. 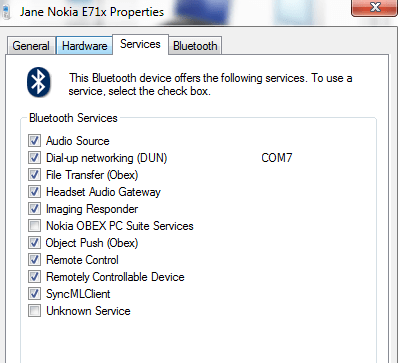 So, if you purchased a laptop recently with Windows 7 already on it, you may not have run into this issue where Windows is unable to install drivers for the Bluetooth peripheral device when you first connect your Nokia E71x phone to your PC. Please note that despite Windows throwing up the driver installation failures, I was able to use all the functions of Ovi suite software with the phone. So for all intents and purposes, getting the extra bluetooth profiles to work as they should for the E71x on your computer may just be icing on the cake. 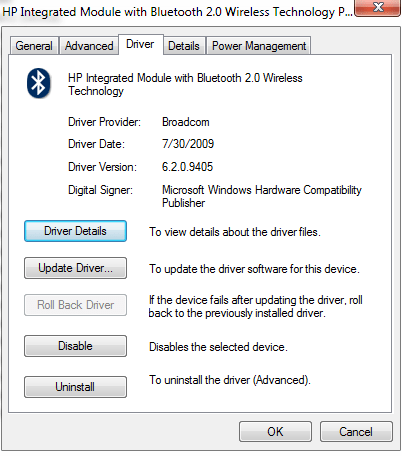 Basically, all I did was install updated drivers for my bluetooth device from HP.com. I installed the DriverCure program and it was able to let me know exactly what driver version I was looking for. Through a process of trial and error, I was able to visit HP’s website and type in new laptop model numbers in order to bring up their “Software and Updates” page. Again, driver installation can be tricky so please ensure you have a working backup of all your files (like I did). Bluetooth hands-free audio:- This lets you listen to audio stored on your phone through your computer’s speakers! Bluetooth headset AG:- This lets you use your computer’s speakers as the ‘speaker’ for your phone. So you can sit back with your computer headset and just talk into the phone! Bluetooth FTP:- pretty self explanatory. There’s now an icon under “My Computers” that allows you to browse the files on your phone. You accept full responsibility for any data/equipment carnage that may happen.